[First published in hardcover, N. Y., Simon and Schuster, 1936. "Love, violence and hate on the high seas." The basis for the 1940 film Strange Cargo starring Clark Gable and Joan Crawford]. "They were fugitives from horror." 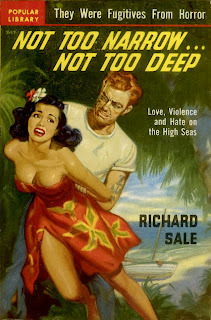 Not Too Narrow’s cover art features a tough guy menacing an island maiden (love the bright red/orange sarong the girl is wearing!). Popular was one of the foremost practitioners of vintage style cover art, but here, for one of their most unforgettable cover designs, the artist is alas unattributed. 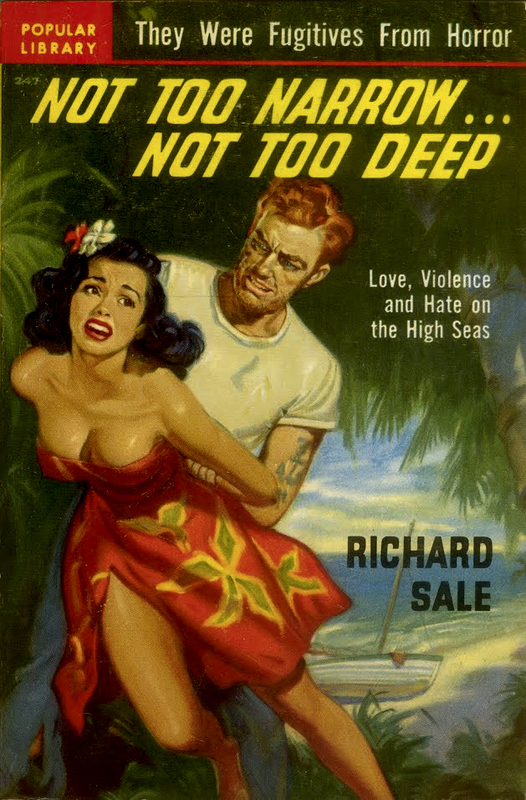 The story takes place in the Caribbean but the girl’s appearance and garb suggest a Polynesian setting. In any case, whoever the cover artist may be, it’s classic Popular Library/Belarski-esque – intensely hyper-realistic; bright colors; bad guy menacing girl theme. “A strange tale with a supernatural hovering of wings throughout.” – review, C. Richard Lanman, Atlanta Constitution, April 26, 1936, p13A.